Single-origin coffee is something we’re used to hearing these days at coffee shops, but have you heard of single-origin matcha? And in the strictest sense of that word, in that, the matcha can be traced back to only one farmer and his tea fields? Gochio Café is a place that takes dedication to matcha to a completely new level. The café is actually run by a matcha farmer, and the reason why this café was started is that he wanted people to have a chance to taste real single-origin matcha, not matcha that is a blend of many types. Matcha may have an image as something bitter, but for high-quality matcha, this does not hold true. There is a distinct sweetness to the matcha used at Gochio Café. One of the greatest joys of going to Gochio Café is getting to taste their monthly matcha espresso. Every month they have a different single-origin matcha from one matcha farm in Uji, and this time I had a matcha espresso made from tea leaves hand-picked at the tea farm of a matcha farmer called Mr. Furukawa. The “crema” on top of the espresso was surprisingly sweet, and the taste of the matcha was very elegant. Matcha and pasta may sound like a weird combination, but actually, this pasta is topped with tencha, matcha leaves before they are ground up to make the powder we all know and love. The crumbled tea leaves on top of the pasta go surprisingly well with the shrimp in it, indeed so well that I would recommend ordering an extra amount of tencha topping for your pasta for 100 yen more. This pasta dish is made from fresh pasta noodles! Dassai is one of the most famous sake brands in Japan, and for a good reason, but did you know you can also get ice cream that is made from the sake lees that are left over when making Dassai? And Gochio Café is probably the only place in the world where you can have this ice cream topped with high-quality matcha. The Dassai ice cream is 100 yen cheaper if ordered as a dessert for lunch. Not all matcha parfaits are made equal. The matcha parfait here at Gochio Café may not be as huge as some other offerings, but the matcha ice cream and chocolate used in it are in a class of their own. The matcha ice cream has a strong, bold taste, but it’s not bitter, there’s an elegance to the taste. You can also have the matcha parfait as a set with the matcha espresso starting at 1,300 yen. 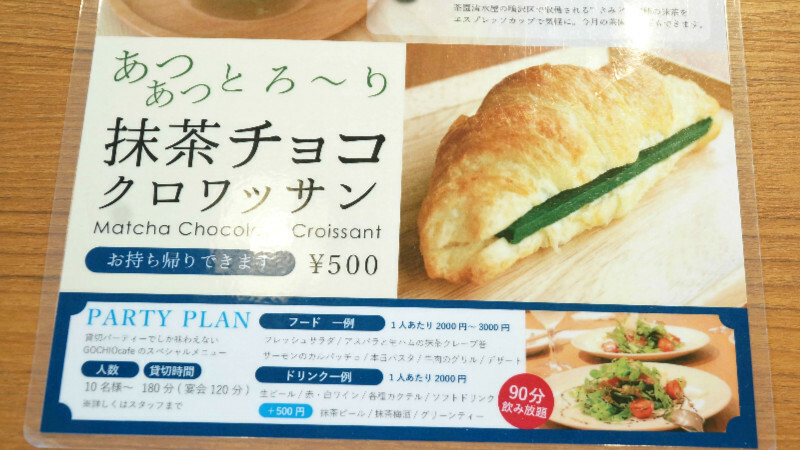 You can also buy food or drinks to go from Gochio Café, and you can also get their famous matcha chocolate croissant to go too. The café is owned by the people behind the artisanal matcha farmers of Shimizu-ya, which is why you can also try the matcha they’ve made, made in the authentic style (so not as an espresso, but in the tea ceremony style). Their “Samidori” matcha is 1,000 yen, and the highest quality Asahi is 1,600 yen per cup, but for this price you also get a traditional Japanese sweet with the matcha tea. I didn’t really know matcha before visiting this café. I had eaten many matcha desserts, and drunk many a cup of matcha, but this was my first time having real high-quality single-origin matcha. The matcha espresso here was not at all bitter, but instead it had a mellow sweetness to it. The matcha espresso of the month is a great way to get to enjoy single-origin matcha; something you normally don’t have a chance to try. A 2-minute walk from JR Uji Station. Monday to Friday: 11:00 a.m.-6:00 p.m. Saturdays, Sundays, and holidays: 10:00 a.m.-6:00 p.m.
Reservations are only accepted for the morning. Irregular holidays. Check their website for the latest information. On weekdays from 11 a.m. to 3 p.m. they have lunch sets with pasta and soup for 1,000 yen and ones with soup, salad, and a drink for 1,200 yen. The names of the dishes on the menu are in English and the staff can speak some simple English.